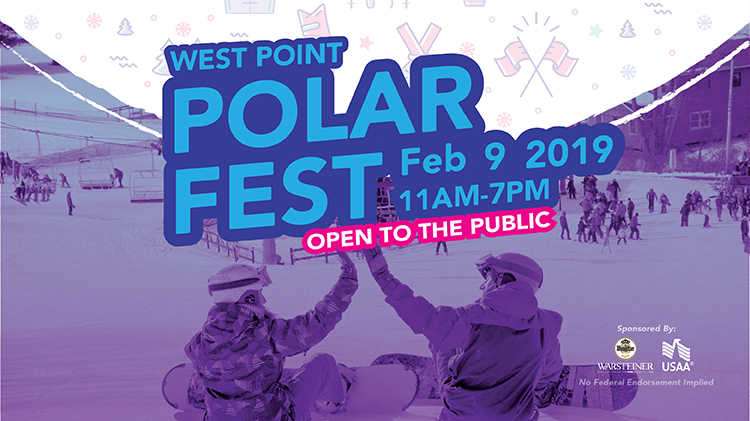 Date: Feb 9 2019, 11 a.m. - 7 p.m.
Join us for West Point's Annual Polar Fest! Open to the Public! Come on out to the Victor Constant Ski Area for a day of family fun! Enjoy skiing, snowboarding, cardboard box derby, big air contest and more! Timed Slalom: Ever wanted to see how fast you could go down a slalom course like the pros? Now is your chance. Come on out to our course and see what your time is. Don’t let your friend’s go faster than you! Bring your cowbells and cheer on the racer’s as they take on the course! Cardboard Box Derby: Test your creativity by constructing a cardboard box that can cruise down our snow-covered hill. The more unique the sled, the better your chances of winning. Teams must consist of 2 to 4 people. Trophies will be awarded for Best Engineering and Construction, Best Design and Best Spirit and Attitude. Registration form must be filled out and brought to VCSA. See you at the starting line!! Snow Hose Race: Teams of 4 people will race through our downhill course while all team members hold on to a 50 foot snow hose. Races will be done head to head, the faster team advances to the next round. Fastest team will win a prize! Big Air Contest: Show of your skills in our Terrain Park. Think you’ve got the best Big Air Tricks? Prove it! Prizes for the first place Male and Female 15 and older and Male and Female 14 and under. Rail Jam: Skiers and snowboarders are invited to show of their skills on our terrain park rails. Show us your best trick. Prizes for the first place Male and Female 15 and older and Male and Female 14 and under. Arts and Crafts: Join MWR’s Arts and Crafts department for some kid friendly crafts in the Ski lodge. Crafts will be offered from 1pm to 3pm and will include projects to choose from such as snowflake bracelets, fun bookmarks and more! Kids Corner: Kids Corner will have tons of activities going on from 2pm to 4pm. Check it out for some snow painting, a fire with S’mores and other exciting games and activities. Eating Contest: Everyone’s favorite event, 8 lucky challengers will get to sign up for this year’s eating contest. Last year was the Monster Burger Challenge. What will it be this year? Tennis Ball Drop: Take your chance at winning some prizes from our Ski Lift as you ride up the hill. Sign out a tennis ball at the bar located outside of the lodge and as you ride the lift, test your aim and try to get your tennis ball into the target under the lift. Every tennis ball that makes it in will be entered in a raffle for some great prizes!!! Tennis balls will be offered from 11am to 2pm. One attempt per person. 12 - 3pm, Food will be available in the lodge. *Vegetarian options available; must be informed in advance. Registration and Race Registration end Feburary 6th. In-person registration is only from February 7th – 9th at the VCSA Ticket Office during normal business hours. Please use the link below to sign-up.